“Don’t be shy, try some pie,” — what started as a casual attempt at beckoning visitors over to their booth at the Yellow Green Farmers Market in Hollywood has now become the motto behind the adorable newly opened flagship store, Pink Pie, in Wynwood. 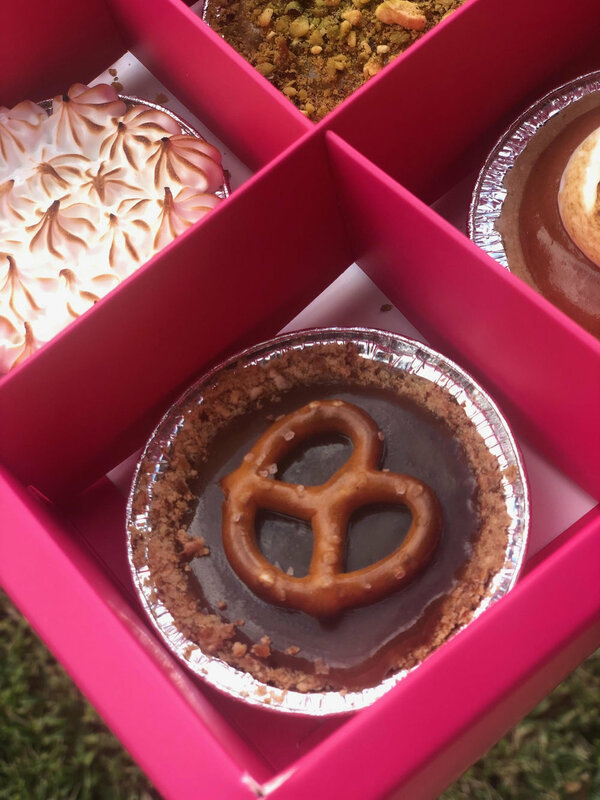 Founded in 2016 by husband and wife duo Michael McGowan and Paloma Machado-McGowan, Pink Pie is South Florida’s only mini pie shop serving 3 inch pies in a variety of flavors. Michael can be found in the kitchen creating pie flavors that cover all the basics — from classic like Key Lime to nostalgic like Birthday Cake to innovative like the S’Mores pie that’s smoked with hickory wood and uses burnt marshmallows inside the filling, recreating the s’mores campfire experience. While Paloma is queen of decor, marketing, and all front of house and guest operations. Together they make the sweetest team around. Fun fact: The sign featuring a pink pie came before the name Pink Pie! At the Yellow Green Farmers Market the booth was often identified by shoppers as, “lets go check out that pink pie over there!” Eventually they pie making couple embraced the name and rebranded. Michael: We met in culinary school in New York while attending Institute of Culinary Education in Manhattan. We ended up being in the same class and spending every day together and eventually ended up dating. After we graduated, I started working as a chef in a couple Michelin starred restaurants. Paloma worked front of house and ended up going back to school to get her Masters degree in hospitality management. How did Pink Pie get its start? Michael: We always had fun making pies together. Paloma loved making pies — one year for Thanksgiving made no less than 9 different pies for her friends. It was awesome! Fast forward to a visit to Yellow Green Farmers market, we noticed no one was making pies. We knew we wanted to move to South Florida and open our own concept. We decided this was our chance to do something different. We knew regular size pies would be tough, because no one wants to walk around a farmers market with a huge pie so we started making regular sized pies and minis. Quickly we noticed that the mini pies were the way to go. We had to do a ton of experimenting to figure out how to get the portions right for the mini pies, because it’s not nearly as easy as just shrinking the large pie recipe. Paloma: We have over 40 pies on the menu, but we are always rotating the flavors. In our Wynwood shop we have two that are permanent at all times: Oreo Nutella and Key Lime. The others rotate with the season or whatever really cool ingredients we find. We are constantly developing new recipes. There’s always a vegan and gluten free option on our menu. And now we are introducing the savory pies. There’s going to be one more breakfast themed (like bacon, egg, and cheese) and one that’s more lunch/dinner style (like chicken onion confit). We are just trying new things out all the time. Recipe testing is when you’ll find me in the kitchen the most. Michael: We get a lot of our inspiration by the food we eat. We love food, we travel for food, we plan vacations around food. We’ve eaten all over the world and that really inspires us and what we test. Paloma: Because our flavors change, my favorites always change. You know when you eat too much of something and you’ve got to switch? My favorites right now are Oreo Nutella, which is an absolute must — it’s so delicious — and Caramel Pretzel, I love the sweet and salty. It’s almost like eating a big candy. Those are my go to right now, but I love them all. Michael: They are like my children. It’s too hard to pick, but maybe our S’mores pie. The reason I love it is because I get to use a lot of the technique I've learned from being a chef in New York City. So I smoke the chocolate in hickory wood to create a campfire taste to it. Then I take burnt marshmallows and fold them into the batter as well. That way when you eat it, you really get the full camping experience. What’s your go to sweet? Paloma: If I’m not eating our pies, then it’s Ben & Jerry’s Ice Cream. Either in Phish Food or Chocolate Brownie. It’s funny, I’m not really a chocolate person but that’s what I gravitate toward with those ice creams. Otherwise, I’m not a big sweets person. It’s hard when you’re around sweets all the time. Michael: I’m making pies every day so I stay away from sweets as much as I can. I try the pies all the time to make sure they are up to our standards, but I’d much rather eat savory food. I love going out to restaurants for a really great meal. If you haven’t made it to Pink Pie yet, add it to your to do list. These pies are as delicious as they are adorable. All pies are the same price regardless of flavor. The larger the purchase quantity, the lower the individual price per item. Pies start at $3.50 for one pie; 2 pies for $6; 4 pies for $11; 6 pies for $15; 8 pies for $19 and 12 pies for $28. For those who aren’t crazy for sweets (we can’t be friends), but still want in on the mini pie experience, Michael draws from his fancy culinary background to create savory pies and plans to have two flavors available every day. Savory pies include Bacon, Egg and Cheese; and Chicken Onion Confit among others. These delicious bite size meals are also $3.50 each. And Pink Pie offers a great coffee program featuring pour over coffee from Counter Culture.